Welcome to the world of superyachts, the world full of excess! Nothing is moderate, everything is top. But, what is a superyacht? 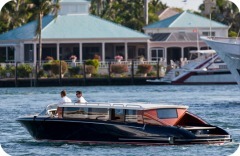 Technically, it is a boat or ship that is meant for pleasure, with a minimum length of 24 meters or 80 foot. 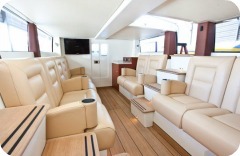 It can be sail or power, private or charter. These superyachts are run by a professional crew. They make sure that everything runs smoothly. The people who buy these yachts are obviously very wealthy. They already have lots of houses and villas, cars, maybe a jet, etc... before they buy a superyacht. It's pretty much the icing on the cake. Imagine, having your own superyacht at your disposal, it's there wherever you want it to be, the whole crew is there for you having an exceptional time onboard, a five star chef who makes all the things you like.... and this all, in complete privacy. It's like having a five star hotel, where the whole staff looks after you with the benefit that it can move to all the beautiful spots in the world. Words cannot describe the world of superyachts, so let me give you a few sites of superyachts where you can enjoy the interior and exterior pictures. 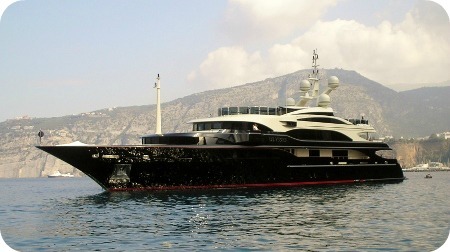 M/Y Nero, a 90 meter classic motor yacht, built in 2008. M/Y Phoenix 2, a 90 meter motor yacht with a giant phoenix on it's bow. S/Y Kokomo, a 58 meter sailing yacht. Infinity pools, jacuzzi's, cinema's, fitness rooms, beach clubs... are no exception too. To transfer people, all superyachts carry at least 1 tender, usually a few more. These are the smaller boats onboard. Some of them even have a helicopter on board. Other might have scooters, bikes or a sportscar onboard. It all depends what the owner likes. It's his or her time and money! Creating a superyacht is not a walk in the park. There's a lot of things to think about and a lot of people are involved. If you want to see the most up-to-date Top 100 of the largest yachts in the world, click here!